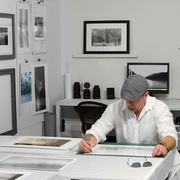 Nicholas Bell is a self-taught fine art photographer specializing in black and white and monochromatic color toned work. He grew up in Tampa, Florida and since 2007 has made his home in Knoxville, Tennessee. Bell's interest in photography began in the late 80’s while traveling through Europe with the U.S. Army. It was here that he gained a deep appreciation for both visual art and the power of photography as a means of artistic expression.